Milodon oil pump pick-ups are engineered for maximum flow and long-term durability, even in the most extreme applications. 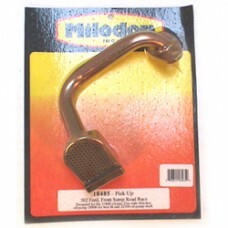 They are fabricated from precision bent, thick wall tubing, of a larger than stock inside diameter and incorporate Milodon’s exclusive high flow, compact pick-up head design and clearance foot to assure correct distance from base of pan and retain proper oil flow. Each pick-up is engineered to work with the listed pan and application. Ford pick-up to pump flange is ground on the face after welding to assure straightness and a leak free mounting. Designed for Ford 302 using MIL31600 oil pan.